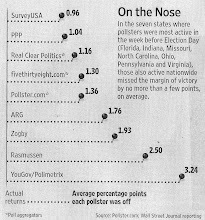 It's a close call but on our North Carolina poll this week John Edwards doesn't quite edge out Rod Blagojevich as the most unpopular person we've ever polled on. 9% of voters in the state have a favorable opinion of him to 81% with a negative one. That net -72 favorability spread is slightly better than the -75 (8/83) we found for Blagojevich in Illinois last year. This is the first time we've polled on Edwards since last January, right after Game Change came out. At that time his favorability was a 15/72 spread with voters in the state. He still had 25% of Democrats seeing him positively to only 55% with a negative opinion. Now his numbers have collapsed even further on that front to a 13/73 breakdown. He was already at single digit favorability levels with Republicans and independents last year and he remains there now. Despite Edwards' near record unpopularity voters are a lot less sold on his being guilty of the crimes he was charged with earlier this month. 52% think he's guilty but 16% believe he's innocent and 32% are not sure. That's a lot of people who don't like him but at the same time aren't convinced he's a criminal. Still a majority of voters thinking he's guilty right off the bat is going to make it hard to find a fair jury if his case really goes to trial.